The first Canadian medal of the 2017 Universiade in Taipei was earned by the swimmers. 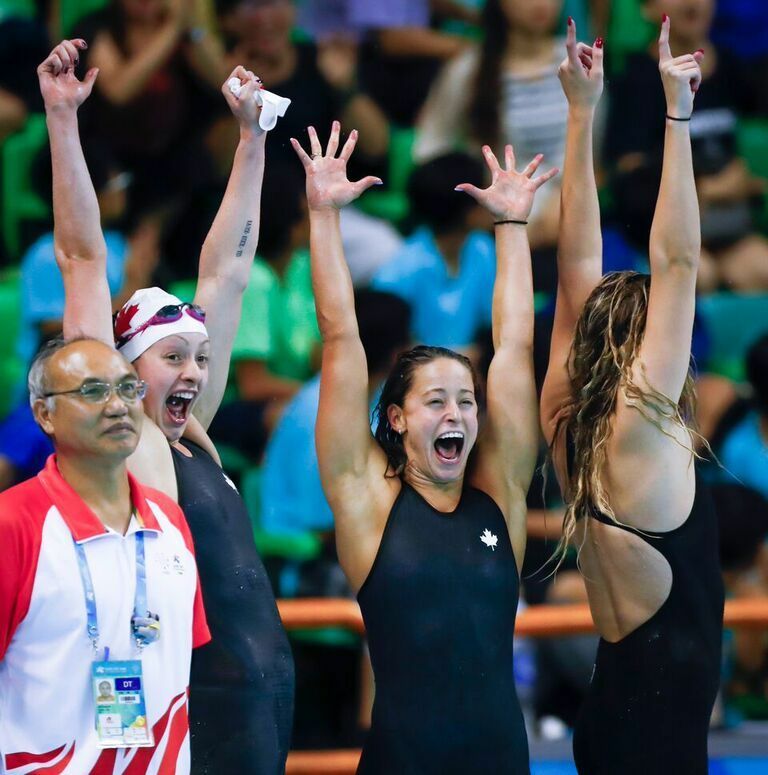 Katerine Savard, Jacqueline Keire, Sarah Fournier and Alexia Zevnik surged ahead of everyone Sunday night in the women's 4x100m freestyle relay to clinch gold at the Taiwan Sport University Arena. The Canadian foursome, swimming in the first lane, were in the lead throughout most of the race, completing the relay with a time of 3:39.21, ahead of Russia (3:39.39) and the United States (3:40.09). “It was really great! We weren’t expecting to win the gold medal,” said Katerine Savard after the race. “We just wanted to be in the pack. We made some changes, it wasn’t the same girls tonight as this morning so we didn’t know what to expect. Because of our view, we couldn’t see very well if we were first. Our eyes were glued to the screen and when we saw that we had won, what a great moment!” she added. Other Canadian swimmers also stood out on the first day of competition at the Taiwan Sport University Arena. Sarah Darcel was in second place in the 400m medley with only 50 meters to go, but just missed the podium, finishing in fourth place. Jeremy Bagshaw came in sixth in the 400m freestyle final. Katerine Savard won her semi-final in the 50m butterfly, qualifying for the final with a time of 26.36. Markus Thormeyer got the eighth fastest time of the 100m backstroke semi-final and will take part in the final tomorrow. Third and fourth in their 200m backstroke semi-final, Mackenzie Glover and Alexia Zevnik will also race in their final.